By now you’ve probably already seen this ad. You may love it. You may hate it. You may wonder what all the hype is about. You may wonder who the heck is John Lewis and why should you care? Since it is getting all the hype (and it made me cry, something very few ads do to me these days) I figure I would break it down for you to show you why it is going viral. Don’t Look or Sound Like and Ad: Check! When I first clicked on a link for this ad that a friend shared with me, I thought I had accidentally linked to a trailer for the new Elton John movie Rocketman. This definitely doesn’t look or sound like any ad you’ll see on television outside of the first Sunday in February—if even then! Tell a Story: Check! I love how they tell the story in a reverse timeline. Like any good storyteller, they take you from what you know to something you don’t know. Make Only One Point: Check! I’m sure John Lewis sells all kinds of products and offers all kinds of services. They don’t talk about any of that. The tagline “Some gifts are more than just a gift” is about the thought you give into gift-giving and the thought John Lewis gives into the products it sells. Speak to the Heart: Check! John Lewis is known for their touching, moving Christmas commercials. This one brought me to tears. Twice. Once at 1:45, again at 2:12. Speak to the Tribe: Check! If you read the comments below the video on YouTube you’ll notice that not everyone is gushing over this ad. In fact, while 90,000 have given it a thumbs up (at the time of this typing), 8,500 have given it a thumbs down. Several people have written comments that they don’t get it. That, in my humble opinion, is the most telling point of how well John Lewis is speaking to the tribe. Roy H. Williams, aka The Wizard of Ads, has been teaching for years that, like a magnet, an ad’s ability to attract is equal to its ability to repel. The more powerfully you speak to your tribe—your customers, the people who share your Core Values—the more likely others won’t get it or like it. Roy also says, “Choose who to lose.” Don’t try to speak to everyone, just the most important ones. This particular ad speaks to several tribes—Elton John fans, Musicians, people with Nostalgia as a character trait, Christmas saps, and people with Giving Gifts as one of their Love Language. I happen to be all of those. If you’re not one of those, you might not get why the rest of us are grabbing a tissue. Some people loved the ad just because it was Elton. Some felt at the end he was lamenting the loss of his parents more than he was waxing nostalgic on the gift—another tribe. Some were remembering their own favorite Christmas gift that inspired them or that they still own today. The ad evoked powerful emotions from several groups of people. Make Your Customer the Star: No Check. I do have to agree with one comment on YouTube where the person said it looked more like an ad for Elton John’s next tour or movie than it did an ad for John Lewis. It certainly did feel that way up until the scene with the little boy coming down the stairs Christmas morning. Prior to that scene it was all about Elton. but in that one moment it was any one of us who has ever come down the stairs wide-eyed and full of excitement on Christmas morning. That scene at 1:45 was the first part that really got to me emotionally. My first blog post ten years ago was about my favorite Christmas gift—a six-string guitar. I’m okay that this ad didn’t fully make “you” the star. It works because of the story. The story works because we all know of Elton. You don’t have the budget to get Elton John into your commercials and that’s okay. John Lewis did and it worked for me. Five out of six boxes checked. That’s why everyone is talking about this ad, and John Lewis. PS Want to do a fun exercise? Go through all the John Lewis commercials here and write down the different tribes each ad is speaking to. It will help you when you start crafting your own powerful ads like these. PPS If you didn’t get this ad or like this ad, that’s okay. It just wasn’t written for you. I watch ads every day that make me scratch my head until I remember, they weren’t written for me. Speak to your Tribe with your ads. That’s what really matters. When people ask me what was my favorite Christmas gift, I often answer my first guitar. I still have it—an Eterna EF-15 six-string acoustic guitar by Yamaha—hanging on the wall with my other guitars. I get a lot of joy from playing guitar. When I first got the guitar I wasn’t very good at playing it, nor was I as motivated to learn how to play as I thought I would be. It was harder than I thought. Then I met Tim Murnen. The Eterna is the second from the right. Tim and I worked together at YMCA Storer Camps. Tim didn’t teach me to play guitar, he inspired me. You see, Tim wrote his own songs, powerful, emotional, poetic visions. I wanted to do that too. So I started learning how to play guitar. Tim had ignited a passion in me. Recently I found an old notebook that had several of my early songs in it. I pulled a guitar down from the wall and began picking at a few of the tunes. It was amazing how quickly they all came back into my memory. They weren’t good. In fact, all but two of them would probably fall under the Geneva Convention rules for cruel and unusual forms of punishment. But it was fun to see the progress I have made from those early days. The other Christmas gift that stands out in my mind was given to me by my radio advertising sales rep. Most years the radio station would give me a mug filled with candy or a clock with the station logo on it or some other tchotchke gift that collected dust on a shelf for a year or two. Linda, however, gave me a copy of Roy H. Williams book, Wizard of Ads. That book ignited another passion in me. I was only halfway through the book when I found out there were two sequels. I ordered the trilogy the next day and started my journey into the world of advertising and marketing. The books spoke to me in powerful ways. I was thinking about these two gifts recently, and the connection between them. Both were about storytelling. Songs tell stories. The best ads tell stories. Tim told stories. Roy told stories. One of my favorite singer/songwriters is the late Harry Chapin who wrote such fantastic, heartfelt songs like Cats in the Cradle, Taxi, and A Better Place to Be. He was the ultimate storyteller. His live album is even called “Greatest Stories Live.” It is an album I can never grow tired of hearing. I’ve always loved stories. Love reading them. Love telling them. Every night when my boys were younger I would tell them a story. Often they would challenge me to make one up on the spot. I would ask them, “Real or made-up?” If they said made-up I would ask, “Funny or scary?” Then we’d get into the story. Those nights are some of my most favorite nights of all. Where is the lesson in this for retailers? It is understanding the connections we make through storytelling. Linda gave ten businesses the same book for Christmas. I was the only one who took it and ran with it. The other nine set the book on a shelf with the other tchotchkes and never went down that path. For them, Linda worked the same way she always had, with professionalism to a tee. But our relationship grew by leaps and bounds until I became one of her biggest fans and cheerleaders. You’re going to tell a story. Not everyone is going to connect with it. But those that do connect will become the spark that sets your business ablaze. Don’t worry about the other nine. Focus on the connections you make, not the ones you miss. Those connections will always be deeper and more profound (and more profitable). Speak to the heart and the hearts that respond will speak of you the way I speak of guitars and wizards. PS My son wrote his college application essay on how he remembers facts and data better when they are in a story than just through plain old rote memorization. There is a lesson in that story for all of you teachers out there, too. PPS This is the “why” stories work. Tomorrow we’ll discuss “how” to make them work. How to use stories is a big part of my workshops on advertising, but there is also an element of storytelling in The Ultimate Selling Workshop. Make sure you sign up soon. You’ve heard the phrase Pay it Forward. Someone does something nice for you, and instead of doing something nice back, you do something nice for someone else. I have several things I need to pay forward in my life, including one act of generosity that happened this fall. I love the concept of Pay it Forward. I love the concept of generosity in the first place. Generosity leads to positive Word-of-Mouth. One area of generosity I encourage my indie retailers is to Pay it Down. Be generous with those who work for you. I served my team bacon and eggs. Be generous with granting them time off. This business is your every waking moment and your life. It isn’t theirs. They have more on their mind than just your business. Be generous with your praise. This is a stressful time of year no matter how enjoyable it is supposed to be. Retail workers not only live that stress, they are on the receiving end of everyone else’s stress. Praise reduces stress. Be generous with your time. Especially in these next few weeks. A little extra time listening to your staff may gain you some incredible insights for ways to improve your store. A little extra time showing you care about your employees will cause them to care more about you and your store. Be generous with your giving. If you’re running your store right, your staff are making you money. Sure, you’re paying them to do that. At the same time, a little extra this time of year makes a world of difference. If you plan to give a gift instead of just money, make it personal and you’ll reap benefits fare beyond your imagination. When you Pay it Down to your staff, you show them how much you appreciate them. We learned from Charles Dickens that’s the better way to act this time of year. PS Little things mean a lot. Hire a masseuse for a day. Cater a big lunch on busy days. Bring in coffee. Give extended lunch hours. 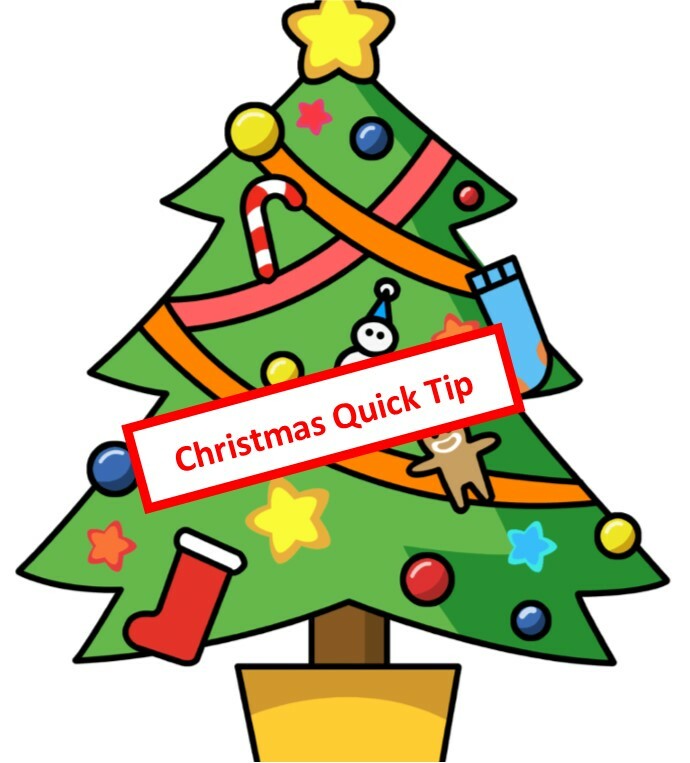 Give gift cards to local restaurants and shops (you can often get those businesses to trade gift certificates with you.) Share treats from sales reps with the team. Bake cookies and make a few extra for everyone to take home. Say thank you. A lot. PPS Be amazingly grateful if someone pays it up. You owe them a lot more than they owe you. Without you, they don’t have a job. Without them, you don’t have a business. I was never big on shopping on Black Friday. I don’t think it was just because I was a retailer. Many of my staff would be up before dawn hitting all the sales before coming in for their shifts. I knew other retailers who would also hit the streets looking for early-bird deals. Since I wasn’t a bargain hunter in general, it wasn’t a big attraction to me. I also knew a secret. I knew that the same retailers filled with door-busters that day would have similar or even better discounts the week before Christmas. Such is the nature of the season year after year. According to Wikipedia, “Since 1952, [Black Friday] has been regarded as the beginning of the Christmas shopping season in the U.S.” What most people don’t know is that it wasn’t the “busiest shopping day of the year” until 2003. The Saturday before Christmas regularly held that title most years. If the new study from Market Track LLC is right, you might see Saturday, 12/23 reclaim the title as fewer people in their surveys say they will be out shopping Black Friday this year. Is this the end of Black Friday as we have known it? And if so, who killed it? The easy answer is eCommerce. The article linked above is already calling it “Cyber Friday”. More people reported in the survey that they would be shopping online. The online sellers are no fools. Rather than give up on Black Friday and wait until Cyber Monday, they are going after the customers’ dollars all Thanksgiving Week and especially on Friday. The other culprit is the big retailers themselves. In a quest to win the Black Friday customers, they started opening earlier and earlier until a bunch of them decided to do sales on Thanksgiving, which led to sales on Monday, Tuesday, and Wednesday, too. You do all that and you take away the frenzy of Black Friday. The problem is most employees only have Thursday through Sunday off. Twenty-five states actually have Black Friday as a government holiday. Start offering your deals Monday through Wednesday and you lose some of your customers. They figure they might as well go online since they can’t get out of work. Some want to blame the media. News reports of fights and people getting trampled will dampen any crowd. The reality is that those stories don’t match the experience for most people since those events are few and far between. Last but not least, some are saying that American Express with it’s Shop Small Business Saturday campaign also had a hand in Black Friday’s demise. We certainly saw that in our last few years of business. Small Business Saturday beat Black Friday for us in 2013, 2014, and 2015. Add it all up and you might think Black Friday is on life support. Before you pull the plug, however, think about this. Twenty-five states still have Black Friday as a government holiday. Many corporations also give their employees that day off. That puts a lot of shoppers on the streets ready to get started on their Christmas shopping. Whether they shop online, in stores, Friday, Saturday, or Sunday doesn’t matter. What does matter is one thing and one thing only—are you the store where they want to spend their money? The big chains, in their race to the bottom to win the Transactional Customers, only have one tool in their tool box—the red markdown pen. You have a whole bunch of tools at your disposal to win everyone else, the Customer Experience being one of your biggest. If you are a clothing store you could have a fashion show with real fashion experts on hand to share tips and help people explore new wardrobes for everyone in their family. If you are a shoe store you could have certified orthotic fitters on hand to do demonstrations and talk about foot health and the importance of proper support. If you are a caterer you could partner with a local retailer and offer food to their customers creating a festive atmosphere for the shoppers that becomes a win-win-win for everyone. There are many ways to win customers during Thanksgiving Week. You know already what the big box and online sellers are going to do. There are a whole bunch of people actually happy that Black Friday won’t be as mobbed with bargain hunters as usual. Go talk to them and show them how shopping at your store will be different, better, and tons more fun. PS It might seem weird to talk about Thanksgiving already. It is only 6 weeks from today. I want you to have enough time to plan something amazingly cool to maximize your weekend sales. If you’ve already seen your sales shift from Friday to Saturday like we did, then plan something special for Saturday to win the Relational Customers. But if you can, plan something special for Friday, too. There are a lot of people not working that day that still want to go shopping. PPS Don’t read too much into your Friday or your Saturday numbers. Look at the week as a whole. The retail world is changing. Black Friday is no longer the sole focus of the week. But attracting customers hasn’t changed. Go find a way to capture your share of the market. We’ve all heard it. You can’t be a retailer with 4th quarter traffic without hearing that a few times. The problem is that we often let that statement ruin our own Christmas. Why do we give it so much weight? Why do we let one customer ruin our day, ruin our holiday, ruin our year? Chances are we weren’t even the responsible party. Most often that statement is said when the customer had an unreal expectation of what you could provide. Or maybe your vendor let you down. Or maybe the customer was just bat-sh#t crazy. Or maybe you did make a mistake, but because your steps to rectify the mistake weren’t perfect, you ruined their Christmas. Why let that get you down? Unless you’re a real f#@k-up, you probably only hear this once every few years. And you’re a stand-up person, so you made it right to the best of your powers. Yet you can still remember the day that mom screamed at you in front of six other customers. The hairs on the back of your neck go up every time you see a brunette in a fur coat just like hers. It colors your whole perception of the season. Why don’t we instead focus on the people for whom we made their Christmas? Revel in those Christmases you made. Celebrate the Thank You’s. Exalt the I Love You Guys. Dance with the You Made My Day’s. There are a lot more of those. Give them the weight they deserve. Pat yourself and your staff on the back. You all deserve that. My book, Hiring and the Potter’s Wheel: Turning Your Staff Into a Work of Art comes packed 60 books to the carton. What would you do if you had 60 of these books? Do you know some businesses who could use help hiring and training a better staff? Yes, that’s right. Buy one carton of books for $1200 and I will show up at your door anywhere in the continental USA and give you 4 hours of my business knowledge to use as you see fit. You will get 60 books to give to your clients that will help them hire and train a better workforce, thus ensuring they will be in business (and buying radio ads from you) for a long time. If you think about it, that’s a far more memorable gift than the mug, candy or flowers you have been giving them. You get 60 business books that are soon to be the talk of the nation. Heck, I’ll bring extra books so that you can hide one under every chair in the audience. You buy 60 books and I’ll pay my own way to get there plus one night in a hotel*. And you get to choose what business training you want for your purchase. My first official day of work at the Toy House came the day after my 14th birthday. With work permit in hand, I joined the team in November 1980 and took my place behind the glass counter that housed all of our handheld electronic games. Games like Simon, Coleco Football, Speak & Spell and others. My parents figured if anyone could explain these games to parents & grandparents, it would be a kid like me. And I was good at it. So good that I could play all the games upside down and backward (that’s how they were to me when I showed them to you) better than most of my friends could play them right side up. What a perfect job – paid $3.35 an hour to play with games! The hot toy that year was Simon by Milton Bradley. 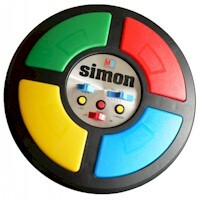 The old Simon with the round black body and four colored lights on top. We owned one at home and I was the champ there, too. We sold tons of Simon games, as many as they would send us. By early December we were sold out. We started a waiting list in hopes that Milton Bradley would ship some more. They did, but still not enough to meet the demand. Every day I looked at the empty spot on the shelf where Simon had sat. The Christmas season flew by fast. It was finally Christmas Eve, my favorite day of the year. We stayed busy until about 3pm when my mom started calling people with big layaways still here. You’d be amazed how many people forget about their layaways until the very last moment. One guy had completely forgotten and had already gone out and bought a whole bunch of other gifts for the kids. He told my mom to cancel his layaway, he’d be in to get his deposit back after Christmas. At 4:05pm, less than an hour from closing and too late to try calling people on our waiting list, my mom brought over a Simon game from his canceled layaway and laid it at my feet. “See if you can sell this before we close,” she said. I turned around a minute later and saw him. He was easily over six feet tall. In retrospect I figure he was in his mid-60’s but he felt so much older than that. The look on his face was tired and beaten. His shoulders were slumped in defeat. He explained to me that he had left Detroit that morning because his six-year-old granddaughter he was raising only wanted one thing for Christmas. He had been to Ann Arbor, Lansing, Grand Rapids, Kalamazoo and Battle Creek but no luck. There are moments in your life when you know there must be some sort of greater power at work. Call it fate, call it destiny, call it Karma. Call it whatever you want, but I knew instantly I was in one of those moments. I felt it even before I leaned down to pick up the Simon game between my feet. “Well, today is your lucky day!” I said as I handed him the last of our Simon games. Thirty years of dust and defeat were shook off in that moment. He started crying, saying “God bless you, God bless you, God bless you.” He reached over the counter and gave me a bear hug. I couldn’t help but join him in the moment. With tears now running down my own face we hugged and hugged as though we were long lost relatives. Still he repeated, “God bless you,” over and over. As he left the store, he shouted “Merry Christmas!” to everyone within earshot, and I swear this old man had a dance in his step as he entered the parking lot. I was fourteen years old at the time. Now I have thirty years of Christmas Eve memories at the Toy House. But none will ever replace that moment in time. I remember the details like it was yesterday. Believe me, he already has!